Words cannot describe the whirlwind of emotions we experienced at the memorial service held today at the 4th Infantry Division chapel at Ft. Hood, TX. 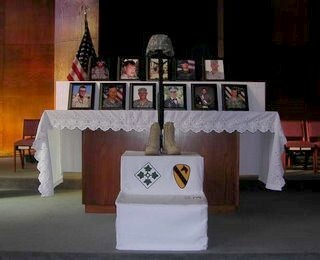 Eleven fallen soldiers from the 4th ID and 1st Cavalry Division were honored for their service and ultimate sacrifice while serving their country in Operation Iraqi Freedom. These 11 heroes gave their lives, and friends and loved ones came together to remember them. 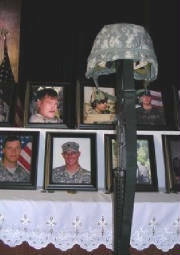 Our brother, SSGT. 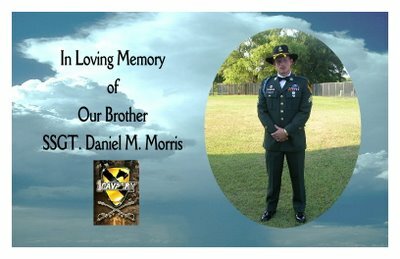 Daniel Morris, who was killed in action in Iraq on November 25, once again, spoke to many by the very life he lived. First Sergeant Hamilton eulogized Daniel, as a man whose religion was not used to run from war, but his faith was his source of strength. His Christian walk was no secret and he was a faithful witness of the Lord Jesus Christ to those around him. A testimony to this fact is that one of the eleven who was killed was a soldier whom Daniel had brought to church in Killeen. The most moving part of the ceremony was the final roll call. The name of each soldier killed was called three times, but there was only silence after each name. Sounds of weeping filled the chapel. Then came the 21-gun salute and taps was played. After the memorial service, we were privileged to meet one of the hospitalized soldiers who was wounded in the IED attack that killed Daniel. He, too, told us how Daniel had tried over and over to get him to church. He said that Daniel, who brought his Bible with him on every mission, had a habit of tapping on it. That is the last memory he has before there was a great flash of light and the explosion. In times of grief, so many people focus on how their loved one died, but for Daniel, the focus has been how he lived. It gives us great comfort and we are so thankful to know he is in God's hands. Yes, there is a certain sadness and great feeling of loss, but we are at peace knowing he has made it Home. Taken from the blog, “One Less Stone, How Can I Be Silent?” By Debbie R.